Limit download of Masaka Transformations to target yourself and some wordings to clarify download restrictions. Game text before errata: "Seeds or plays on table. Each time a card provides two or more card draws, no more than one may be converted to a download. Also, to move or initiate battle, each ship that has one or more staffing icons (and each Interceptor) requires at least two crew members aboard. 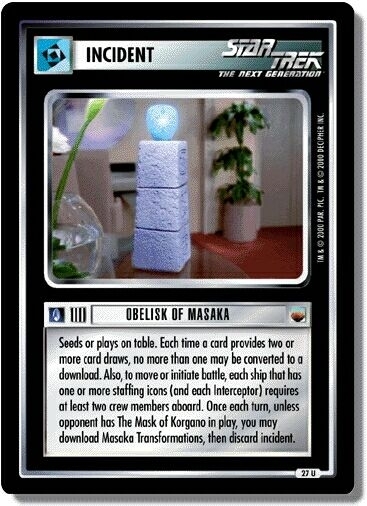 Once each turn, unless opponent has The Mask of Korgano in play, you may download Masaka Transformations, then discard incident." You may use this incident to download Masaka Transformations only during your own turn. It does not allow you to convert card draws to downloads; it limits the number of card draws you may convert to downloads using another card with such a function, such as the Borg Queen. 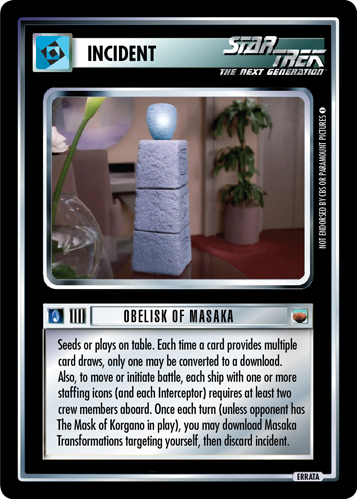 There are 11 entries for Obelisk of Masaka (ST1E 9 U 27) at the Tradeplace (19 haves and 2 wants). Click here to see all trade list entries for this Uncommon card!